Sharm el-Sheikh, Egypt, 21 February 2016 – His Highness the Aga Khan today extolled Africa’s resilience, economic progress and new willingness to accept diversity. “What I see emerging today is a refreshingly balanced confidence in Africa – a spirit that takes encouragement from past progress, while also seeking new answers to new challenges,” he said. The Imam (Spiritual Leader) of the Shia Ismaili Muslims made the remarks in a keynote address to the “Africa 2016: Business for Africa, Egypt and the World” conference in Sharm el-Sheikh, Egypt, hosted by Egypt’s president, His Excellency Abdel Fattah el Sisi. The Aga Khan noted the decidedly upbeat spirit about Africa’s economic future that emanated from the speeches of African leaders taking part in the conference. “My enthusiasm today is especially strong because of the message which is at the heart of this Forum. And that message is, quite simply, that Africa’s Moment has come,” he declared. While cautioning that Africa still faced formidable challenges, including high unemployment levels among the continent’s young people, he said that the continent had made significant progress in a number of key areas. “The story of Africa’s progress and potential is also impressive – whether we talk about growing GDP and foreign direct investment, whether we look at economic diversification and national resiliency, whether we chart the rise of a vital middle class – and the expansion of consumer spending – now breaking through the one trillion dollar mark,” he said. He noted that the experience of the Aga Khan Development Network, which is active in 13 African countries and works in an array of sectors ranging from health to education to culture to economic development, supports the positive picture. He observed that fragmentation has long been one of the continent’s main weaknesses. “The problem of fragmentation has often afflicted Africa, separating tribe from tribe, country from country, the private sector from the public sector – those who hold political power from those who are in the opposition,” he explained. And yet the Aga Khan noted that Africa has shown new willingness to embrace diversity and emphasised the importance of civil society in creating an enabling environment for progress. Building on this idea, the Aga Khan emphasised the need for strong Civil Society institutions in Africa’s quest for development, noting that Civil Society has often been underappreciated, marginalised or even dismissed. “I focus on Civil Society because I think its potential is often under-appreciated as we become absorbed in debates about the most effective programs of governments and others, or the most successful business strategies. But, in fact, it is often the quality of the third sector, Civil Society, that is the “difference-maker”. It not only complements the work of the private and public sectors, it can often help complete that work,” he said. He lauded the positive role Civil Society played at key junctions in Africa’s recent history. “The influence of Civil Society has also been felt at seminal moments in the continent’s recent history, for example: in shaping the Arusha Accords which recently ended 12 years of civil war in Burundi, in the peaceful resolution of the violent clashes in Kenya following the 2007 elections, in the drafting of a new promising Tunisian Constitution, and in the courageous response to the Ebola crisis” he said. His Highness the Aga Khan, the founder and chairman of the AKDN, is the 49th hereditary Imam (Spiritual Leader) of the Shia Ismaili Muslims. In Islam’s ethical tradition, religious leaders not only interpret the faith but also have a responsibility to help improve the quality of life in their community and in the societies amongst which they live. For His Highness the Aga Khan, this has meant a deep engagement with development for almost 60 years through the agencies of the Aga Khan Development Network. Founded by His Highness the Aga Khan, the Aga Khan Development Network (AKDN) is a group of private, international, non-denominational agencies working to improve living conditions and opportunities for people in specific regions of the developing world. The Network’s organisations have individual mandates that range from healthcare (through over 200 health facilities including 13 hospitals) and education (with over 200 schools) to architecture, rural development, the built environment and the promotion of private-sector enterprise. Together, they work towards a common goal – to build institutions and programmes that can respond to the challenges of social, economic and cultural change on an on-going basis. AKDN works in 30 countries around the world, employing approximately 80,000 people, the majority of whom are based in developing countries. The AKDN’s annual budget for non-profit development is approximately US$ 625 million. AKDN agencies conduct their programmes without regard to faith, origin or gender. 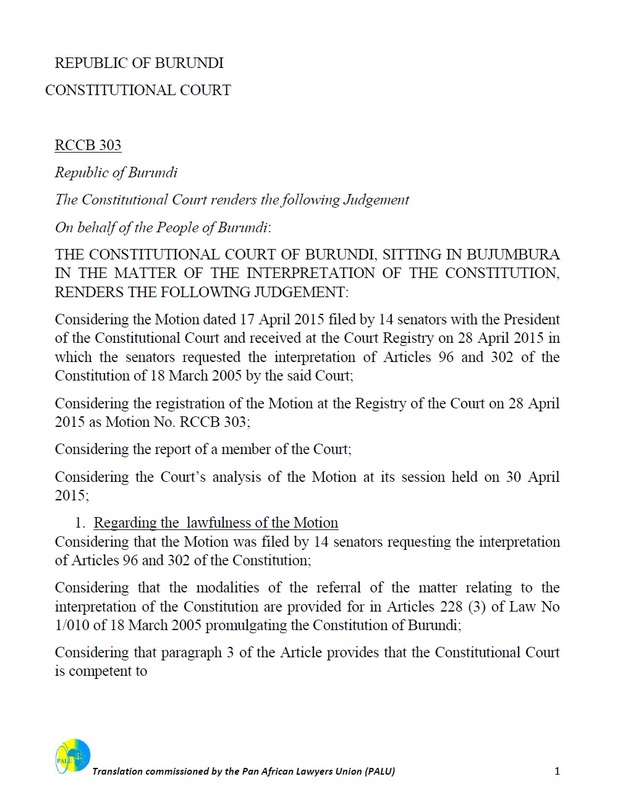 That the decision by the Constitutional Court of Burundi was reached under great pressure and intimidation. 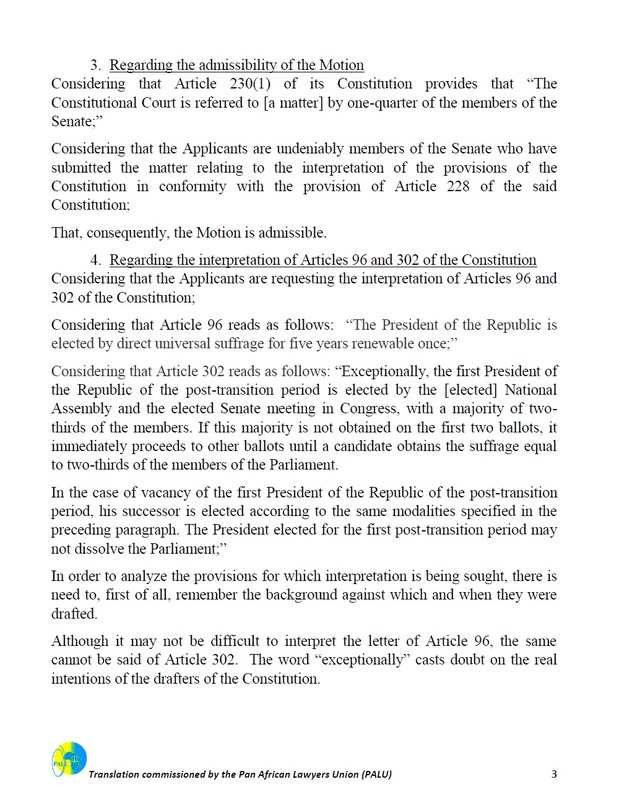 This became apparent when the vice president of the Court, Mr. Sylvere Nimpagaritse fled the country and the decision was thus reached in the absence of a full bench. Threats and intimidation continue: On 28th June 2015, the Speaker of the National Assembly, Mr. Pie Ntavyohanyuma fled the country, on 25th June 2015 the 2nd Vice President of the Republic, Mr. Gervais Rufyikiri also fled, on 30th May 2015, the Vice-President of the Commission électorale nationale indépendante/Independent National Electoral Commission (CENI) of the Republic of Burundi, Ms. Spes-Caritas Ndironkeye, together with a Member of the said Commission, Ms. Illuminata Ndabahagamye fled as well. 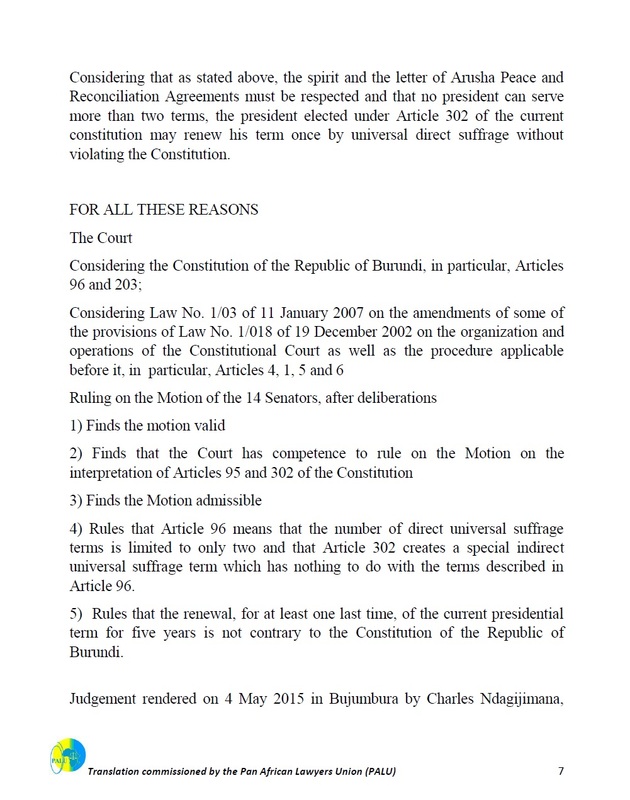 An Order to quash the decision of the Constitutional Court of Burundi and the CENI’s decision which allowed Pierre Nkurunziza to run illegally for third term. 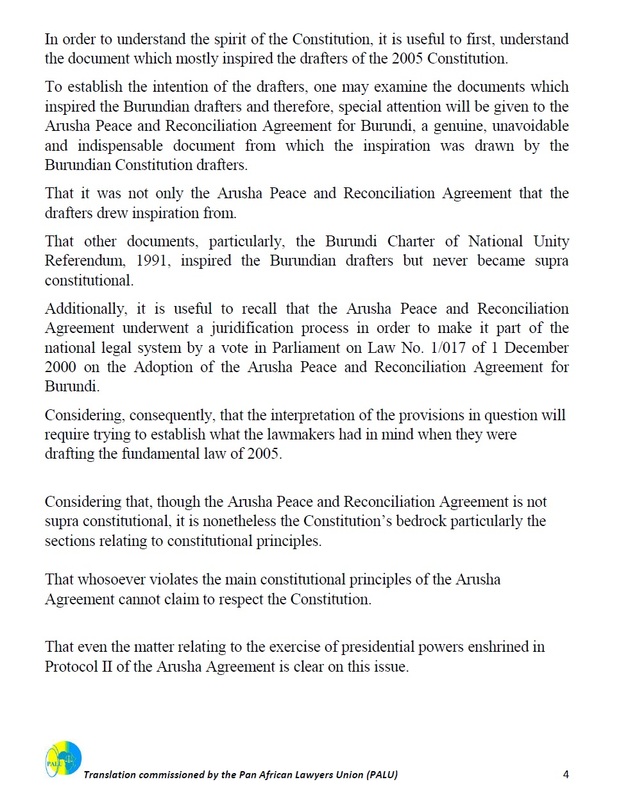 Click here to read the official press statement by the Burundi Civil Society Organizations engaged in Citizens’ initiative to ensure compliance with the Arusha Peace and Reconciliation Agreement for Burundi and the Constitution. WikiLeaks Series – Pre-2010 General Election in Burundi: Part One. This here now will be a part of series of WikiLeaks discoveries on Burundi. For people who are not part of the Francophone world a lot of the information here will be new. Therefore I choose to drop it. It will be all pre 2010-Election in Burundi. This series will be directly about the preparation of the 2nd term of President Pierre Nkurunziza and his party the CNDD-FDD. This is part I. Enjoy! “Minister of Good Governance Venant Kamana characterized the legislative problems within the National Assembly as primarily a dispute over the constitutionality of Nkurunziza’s government. Kamana explained that there are two major points of contention between the government and the major opposition parties. 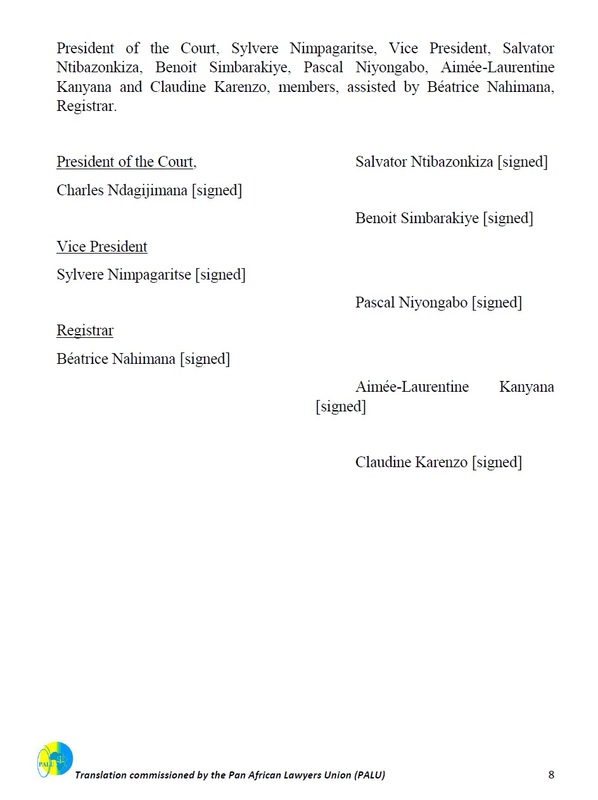 According to Kamana, the opposition claims that they have constitutional rights to a proportion of government positions based on the election results of 2005” (…) “Nkurunziza construed their refusal to comply as a desire not to participate in the government and therefore formed a new cabinet independently. 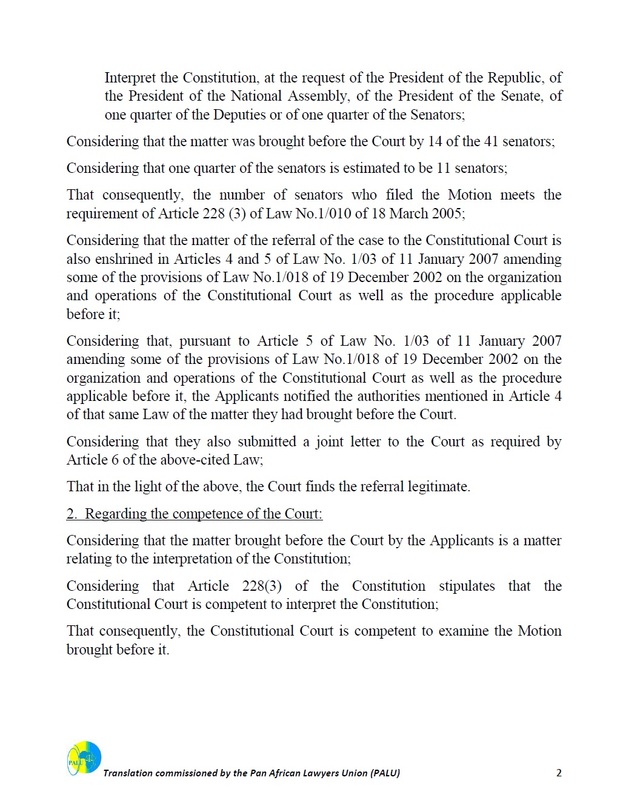 Kamana suggested that any further dispute about the constitutionality of the government be decided by the constitutional court and further warned that any attempt to claim that the government is unconstitutional and without authority would provoke public disorder” (…) “In light of the recent arrest of the former Central Bank Governor, Kamana did not understand FRODEBU’s claim that nothing was being done with respect to the Interpetrol. Kamana also disputed FRODEBU’s assertions that various cases of embezzlement have been ignored and said that cases of embezzlement have never been filed at the office of the Prosecutor General. Kamana acknowledged that the Muyinga case is currently in the hands of the military prosecutor who has current jurisdiction” (…) “Nkurunziza and his National Council for the Defense of Democracy – Forces for the Defense of Democracy (CNDD-FDD) loyalists are clearly going on the offensive by addressing their concerns and reasons for the economic and political stagnation directly to the people” (WikiLeaks, 2007). “The leader of Burundi’s MRC party and member of the National Assembly, Epitace Bayaganakandi, shared his perceptions of the political impasse plaguing the Burundi government with the Ambassador on August 6” (…) “Bayaganakandi claimed that FRODEBU, UPRONA and the ruling National Council for the Defense of Democracy – Forces for the Defense of Democracy (CNDD-FDD) party each have 2 wings consisting of those who actively seek cooperation and compromise with Nkurunziza’s government, and those who refuse to participate in the legislative process. He noted that certain factions of the Union for National Progress (UPRONA), the Front for Democracy in Burundi (FRODEBU), and even the ruling CNDD-FDD party do not want to share in the blame and the responsibility of the problems plaguing Burundi today and are instead distancing themselves to protect their political agendas for the future” (…) “Bayaganakandi stated that his predominately Tutsi MRC party was less than 5 years old, originating during Burundi’s transitional period following the civil war. Bayaganakandi declared that the objective of his centrist MRC party was to be a catalyst for institutional change throughout Burundi’s political, economic and social spectrum. Unfortunately, he complained, since 2005, little or no change can be seen other than in the areas of security, education and health. Instead, Bayaganakandi points to corruption, human rights abuses, extrajudicial killings and various financial scandals as the major contributions of Nkurunziza’s ruling government” (…) “In particular, in light of recent scandals and political failures, Bayaganakandi urged President Nkurunziza to take heed of the distinction between political positions and technical positions. Bayaganakandi explained that appointees to critical positions cannot be made out of loyalty without respect to their relative experience. He pointed to the naming of Isaac Bizimana, a former cashier for the CNDD-FDD party, as the Governor of the Central Bank and who is now in custody for possible misappropriation of funds in the recent Interpetrol scandal” (Wikipedia, 2007). “Forces for the Defense of Democracy (CNDD-FDD) party intends to hold onto power well into the future and accused President Pierre Nkurunziza of progressively moving away from a government based on democratic values towards a military dictatorship more akin to the culture and past of the ruling CNDD-FDD party” (…) “Burundi President Domitien Ndayizeye opined that the CNDD-FDD is unwilling to work with opposition parties and intends to hold onto power well into the future. The former president surmised that the CNDD-FDD is actively marginalizing all Hutu opposition as well as those parties predominantly representing the Tutsi minority” (…) “The FRODEBU leader lamented that the ruling CNDD-FDD party would rather reward good militants rather than using Burundi’s educated loyalists to help manage Nkurunziza’s government. He emphasized the need for a nation to have an army rather than having armies for political parties. Ndayizeye believes that Nkurunziza has eyes only for a military that will fight for the President and expressed his concern that Nkurunziza could become a dictator led by the military in much the same fashion as was detrimental to Burundi’s stability in the past” (…) “President Nkurunziza should respect Burundi’s constitution and the Arusha Peace accords upon which the constitution was founded. 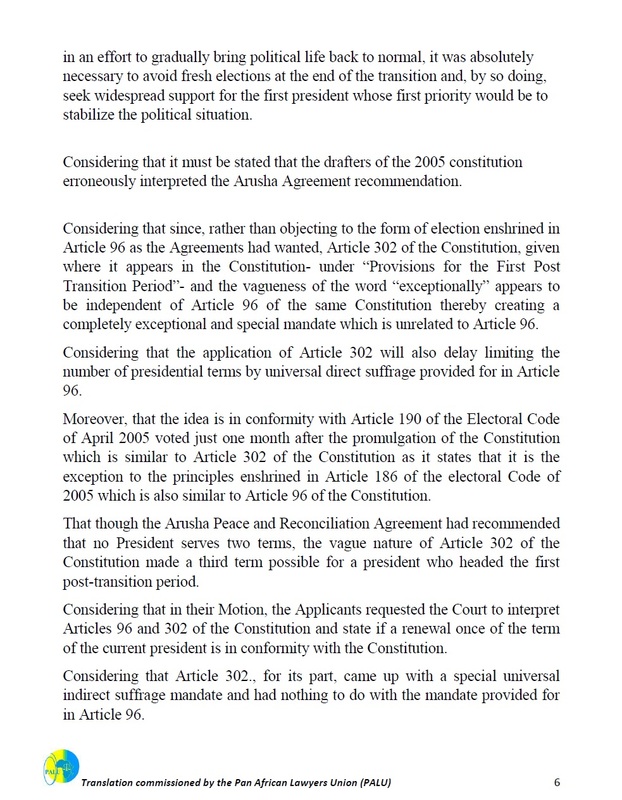 In addition to Nkurunziza’s departure from the constitution, the former president insisted that Nkurunziza refuses to commit to dialogue with other political factions and Nkurunziza’s action are running counter to national reconciliation, both significant priciples brought forth from the Arusha accords” (…) “Nahimana claimed that the CNDD-FDD party was rejecting the Arusha accords during the September 2006 ceasefire talks with the PALIPEHUTU-FNL and and only accepted the Arusha principles by force” (…) “Political observers have speculated that Ndayizeye, who is still a popular and influential figure in Burundi and who was jailed in 2006 by Nkurunziza on suspicions of plotting a coup, is seeking personal revenge against the current administration and the CNDD-FDD party, and may have his sights on the presidency once more” (WikiLeaks, 2007). “Nyangoma, who returned to Burundi on July 15 after 10 months of temporary refuge in France, cited corruption, the lack of movement within the Parliament, and poverty as the major components to a growing ‘institutional crisis’. In offering a solution to the political quagmire, he emphasized the need for immediate dialogue between the ruling National Council for the Defense of Democracy – Forces for the Defense of Democracy (CNDD-FDD) party and the major opposition parties” (…) “Nyangoma also suggests that the specter of war still plagues the population, strengthened by the lack of progress in the ceasefire process, and the abundance of weapons among the Burundi people. 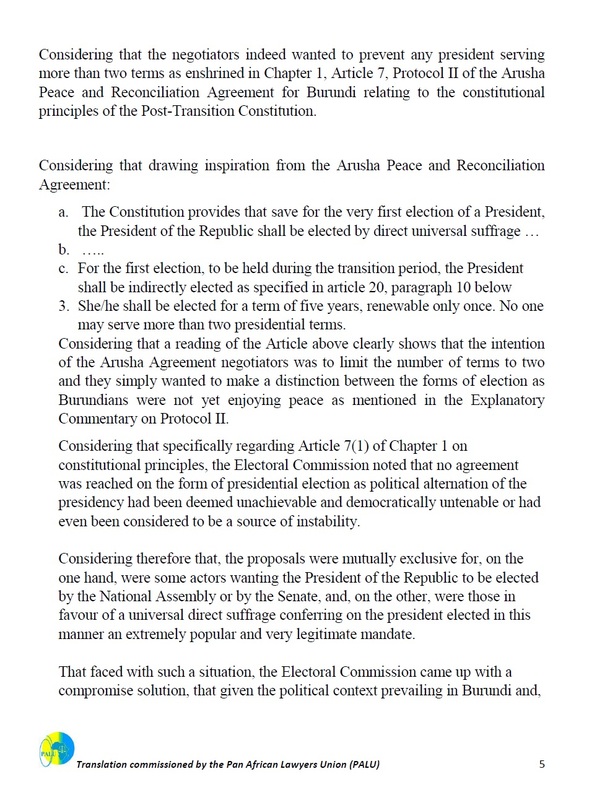 The situation is further aggravated by the inability of the government of Burundi (GOB) and the PALIPEHUTU-FNL to negotiate in good faith as dictated by the September 2006 ceasefire agreement” (…) “the CNDD party head suggested that various portions of Burundi’s constitution should be changed to improve the electoral process. He further hoped for the creation of laws that would govern the political opposition process, stating that it was necessary to have a credible opposition for an effective democracy” (…) “He proposed that an international commission, specialized in the investigation of economic crimes, should be put in place to delve into suspected improprieties by the current government since its inception. He compared his proposal to the recent effort by a similar commission that investigated the controversial sale of the presidential jet. Nyangoma stated that the GOB needs the trust of the international donor community and implied that Burundi’s financial and developmental partners had no confidence in believing that resources were going to the right places” (…) “Nyangoma also suggested that another international commission be created to shed light on all suspected crimes against humanity and human rights committed by the current administration, such as the extrajudicial killings in Muyinga and the arrest and prosecution of the suspected coup plotters in 2006. Noted for his staunch allegiance to a strong judicial process, Nyangoma questioned why Nkurunziza’s administration insists on separating justice from reconciliation. In the spirit of the Arusha peace accords, Nyangoma advocates the installation of a truth and reconciliation committee to investigate the abuses of the past” (WikiLeaks, 2007). Hope you got some new knowledge. And to be continued!